Ecosystem valuations assess the financial value of ecological processes to encourage the inclusion of environmental values into business and governance decisions. This study, focusing on the Canadian and US sides of the northern Saalish Sea, is David Suzuki Foundation’s first valuation of marine-centric services . 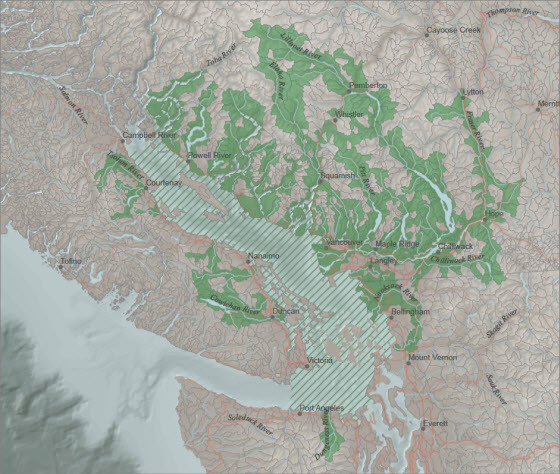 Geocology assembled, commensurated, quantified and mapped landcover, watershed and nearshore habitat datasets from both sides of the border. 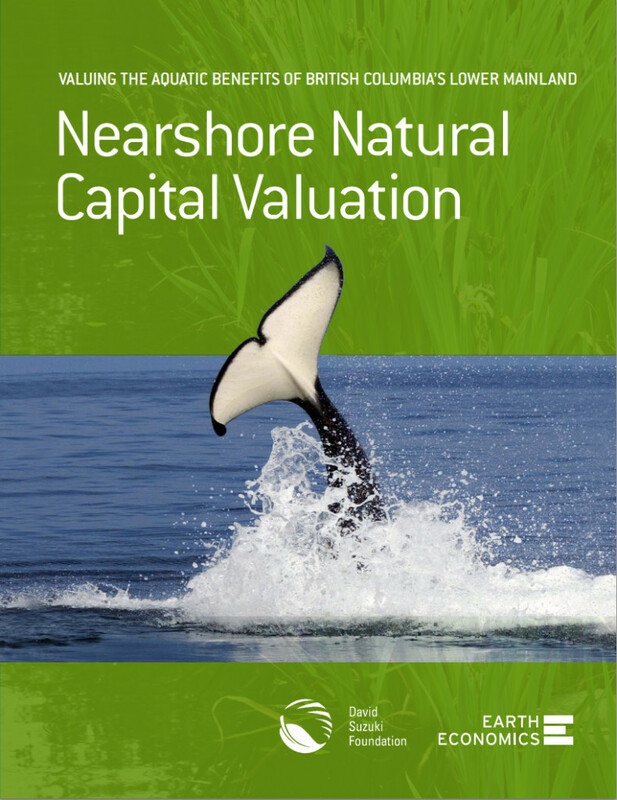 Natural capital valuations attempt to put dollar figures on the human benefits provided by ecosystems, giving policy makers a chance to include those values in decisions that might otherwise treat them as intangible. 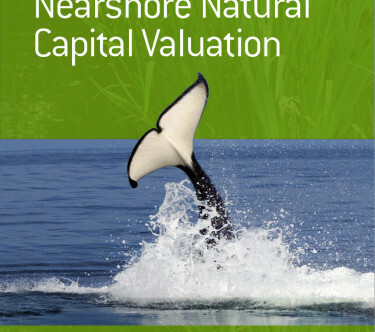 The David Suzuki Foundation has previously conducted many terrestrial valuations but the Nearshore Natural Capital Valuation was their first attempt to measure natural capital in aquatic systems. 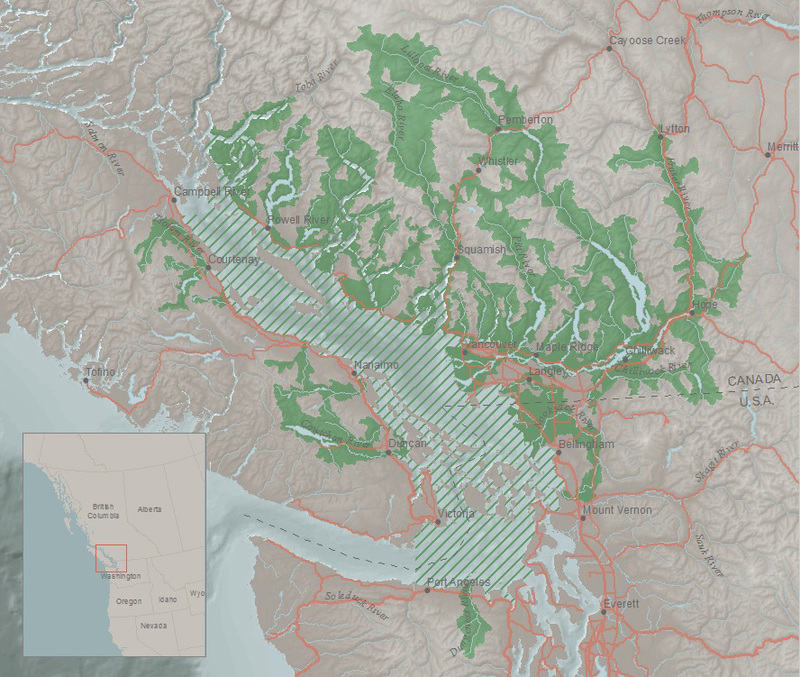 DSF partnered with Earth Economics to develop a rigorous framework for calculating those values, and Geocology Research handled habitat research, analysis and cartography. This project was made both more interesting and more challenging by its international nature. 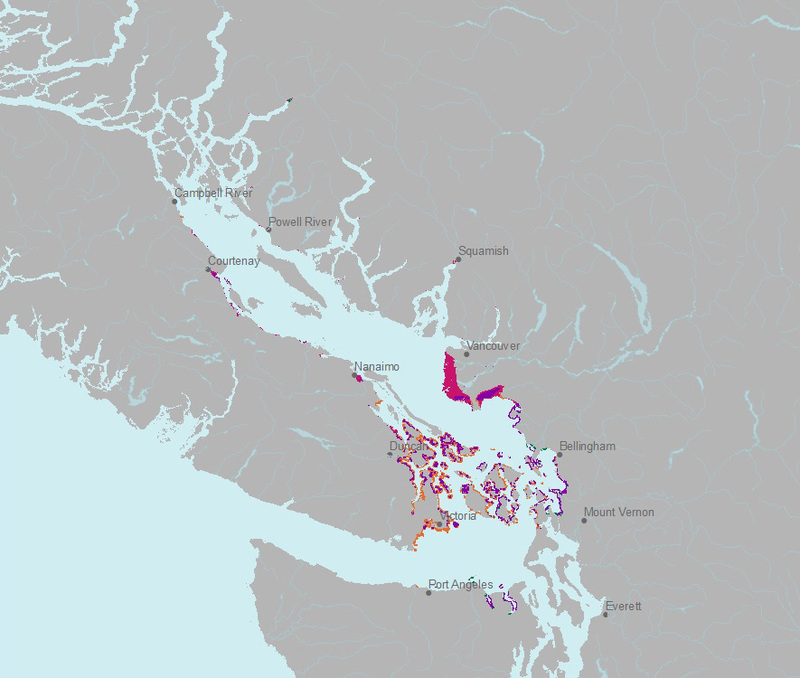 The Salish Sea ignores the US-Canadian border, but the data we needed for it was very much divided between the institutions of the two countries. Categories and methods needed to be well understood so that we could transform and ultimately harmonize the data. We used data from shoreline habitats, forest inventories, landcover databases, fishing returns, and hydrographic networks to produce our tallies and break-downs. Once the research was finished and the numbers had been crunched, Geocology’s final contribution was producing maps to effectively convey our methods and conclusions. 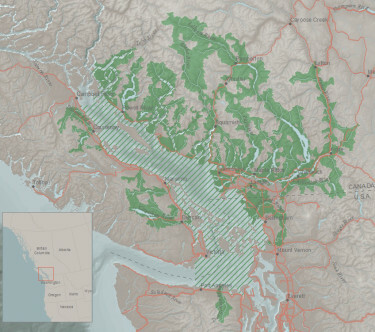 Geocology used our experience with landscape cartography to generate images for the report which attempt to combine an attractive aesthetic with transparency of information. 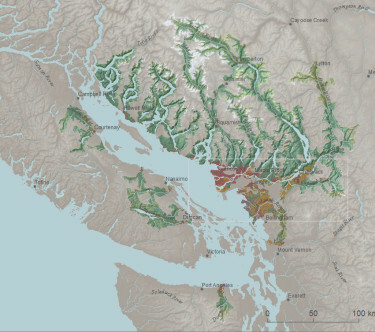 A particular challenge was shoreline features which were themselves quite “thin”, but which were spread across large regions of the Salish Sea and it’s riparian inputs. 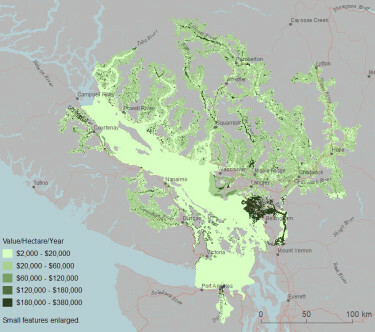 The report concluded the Salish region’s ocean, beaches, wetlands, riparian forests, lakes and rivers contribute between $30 billion and $60 billion dollars in economic benefits to humans. Click here to download the published report and read how we reached those figures, and for more in-depth analysis.